This website offers some basic information about depression and how DEPLIN® can help, but talking with your doctor is the best way to decide if DEPLIN® is right for you. The next step is to download and print this guide, which includes questions to discuss with your doctor and a chart to help you track your progress over time. The active folate in DEPLIN® capsules helps boost the production of natural chemicals in the brain that may affect mood. Without this active folate, your body’s ability to produce these chemicals may be limited. The following resources offer education and support for people with depression and their families. Please note: These resources are cited for information purposes only and do not imply recommendation or endorsement by Alfasigma USA, Inc.
Savings, support, and resources for patients taking DEPLIN®. 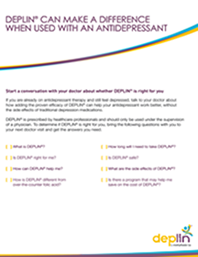 Bring this discussion guide to your next doctor’s appointment to help you learn more about your depression.